Student i2 Passport Program winners pose with donor Harry Patten '58 (left in photos) and ECenter director Ian Grant (right). Students, clockwise from top left: Peter Abdu '17, Abby Kourafas '18, Brady Camplin '18, Qiqi Chen '18 and Jayson Folsom ’20, Venus Chau '19. UNH’s Peter T. Paul Entrepreneurship Center (ECenter) recently awarded $19,500 to six UNH students as part of the i2 Passport Program (Ideas and Innovation Passport Program), funded by a portion of the $50,000 gift from Harry Patten ’58. 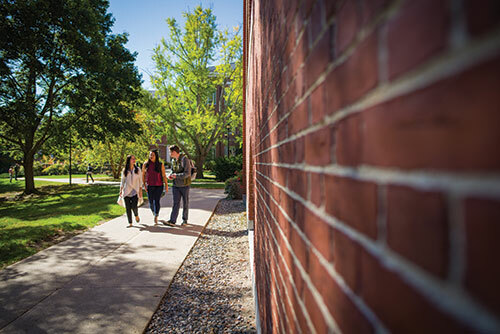 “With this gift from Mr. Patten, we were able to provide every UNH undergraduate degree-seeking student with access to a wide variety of programs in the areas of ideas, innovation, and entrepreneurship while tackling the number one pain point for students today: student debt,” said ECenter director Ian Grant. The i2 Passport Program is designed to drive voluntary activity and event engagement by all undergraduate students in the areas of ideas, innovation, and entrepreneurship with the reward of winning money to help pay off student loans or tuition. Students are awarded “visa stamp credits” in their "passports" for each identified activity in which they participate. $8,000 for the most visa stamp credits with 36,200 out of a possible 36,700, awarded to Peter Abdu ’17, an electrical engineering major at the College of Engineering and Physical Sciences. $3,500 drawing for first-generation students who reached 23,100 visa stamp credits or higher (platinum level), awarded to Abby Kourafas ’18, a business administration major in the Paul College of Business and Economics. $3,500 drawing for any two students who reached 23,100 visa stamp credits or higher (platinum level), awarded to Brady Camplin ’18 and Venus Chau ’19. Camplin is a bioengineering major in the College of Engineering and Physical Sciences. Chau is an information systems and business analyst major in the Paul College of Business and Economics. $500 UNH Bookstore gift card drawing for any two students who reached 7,000 visa stamp credits or higher (silver level), awarded to Qiqi Chen ’18 and Jayson Folsom ’20. Chen is an economics major in the Paul College of Business and Economics; Folsom is a bioengineering major with the College of Engineering and Physical Sciences. “i2 Passport forced me to branch out. I participated in a number of things, none of which I would have participated in without the i2 Passport Program. Specifically, for my start-up Sol Solution, my team and I were awarded the Summer Seed Grant, first place in the Nelson Poster Competition, and second place in the Holloway Prize Competition,” said first prize winner Abdu. The Peter T. Paul Entrepreneurship Center (ECenter) in the UNHInnovation wing of Madbury Commons is intentionally independent of any one college on campus. The ECenter’s goal is to continue building the positive and supportive ideas, innovation, and entrepreneurial culture at UNH, for all students, faculty, staff, researchers, and alumni. The ECenter has already established itself as the hub in its area on campus. Other programs established include a Start-up Entrepreneur Speaker Series, six bootcamps centered around networking, marketing, sales, idea creation, legal, and funding, a hackathon, one-on-one coaching, the $10,500 Summer Seed Grant, and the Paid Student Internship at Start-ups Program. Physical resources include co-working zones at Alpha Loft at the ECenter, Makerspace at the ECenter, and the Caffeinator Coffee Bar at the ECenter. For more information about all the ECenter has to offer, including a full program schedule, visit www.unh.edu/ecenter or follow on Facebook, Twitter, Instagram, LinkedIn, YouTube, and SnapChat at @UNHECenter.